Suspected members of the Boko Haram sect have attacked Kuda village of Madagali local government area of Adamawa state. The terrorists killed at least 6 people and razed more than 20 houses in the attack, naija.com reports. ACCORDING TO THE REPORT, an elderly woman was also reportedly burnt to ashes in the raging inferno. The Punch reports that the insurgents invaded the village at 9pm on Monday, February 15, when the villagers were preparing to go to bed. They shot at fleeing villagers, killing five people and injuring several others. Eyewitnesses said that the heavily armed insurgents invaded the village on foot and carted away some valuables. 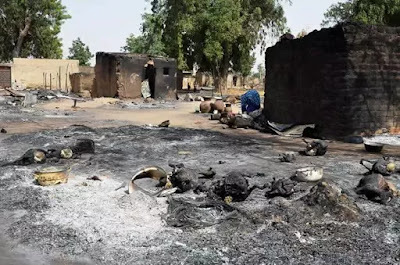 Abubakar Kanuri, the head of Krichinga, whose village is close to Kuda village, confirmed the incident and revealed that the insurgents came through Malakwaya, a section of the Sambisa forest. The village head said, “But I know that one old woman was burnt to ashes because she couldn’t flee her home when the insurgents set her house ablaze,” he said. “Today, they will invade our villages as rustlers, another day they stormed our villages in convoy of vehicles and some time they will use cattle to deceive us that they are normal herdsmen only to start killing people. “We need help in our area. Many are beginning to return but with current security situation, they may not return to these areas.” “Thes crazy boys are still hiding in caves inside Sambisa forest,” “The best thing is to follow them to their hidings than allow them to continue to kill innocent Nigerians,” he added.